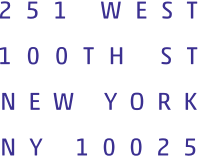 Ansche Chesed was founded in 1829 by a group of German, Dutch and Polish Jews who had seceded from Congregation B’nai Jeshurun, which itself had split off from another New York synagogue, Shearith Israel. Such secessions were not uncommon in pre-Civil War Manhattan and the precise reasons for the break are no longer known. By the mid-19th century, Ansche Chesed’s membership was dominated by Jews of German origin. 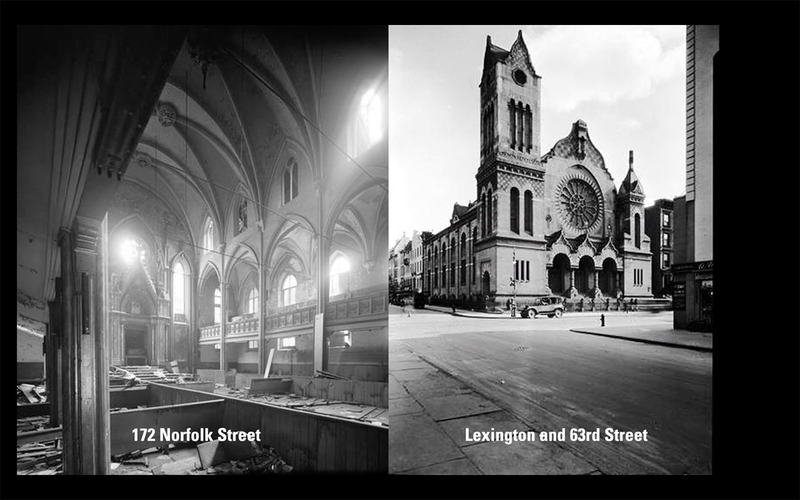 The congregation initially met in rented quarters on Grand Street and has occupied at least five different buildings around Manhattan. The first home Ansche Chesed built for itself, on Norfolk Street on the Lower East Side, now houses the Angel Orensanz Foundation. Ansche Chesed later decamped to East 63rd Street and Lexington Avenue and in 1908 headed further north to then-fashionable Harlem, where the congregation built a pillared, neo-classical structure at 114th Street and Seventh Avenue (now Adam Clayton Boulevard). In 1927, Ansche Chesed laid the cornerstone for what would become its permanent home on West End Avenue and 100th Street. 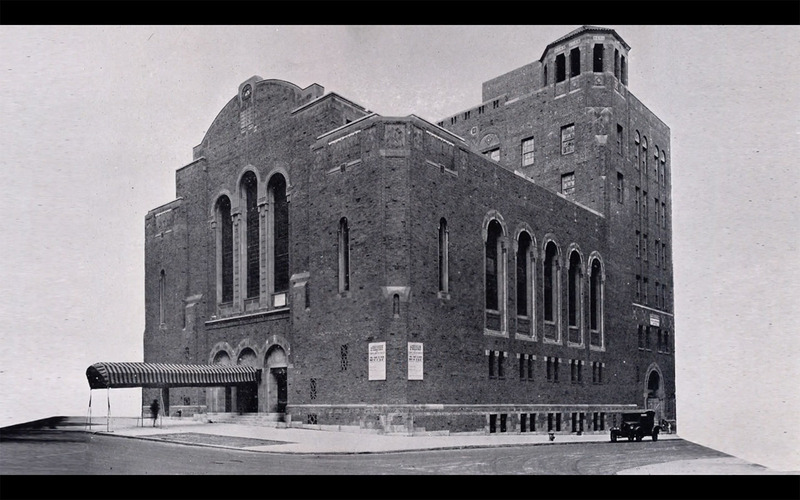 The majestic, buff-brick synagogue was dedicated in 1928 and the congregation has remained there ever since. Designed by architect Edward Isaac Shire (October 1874 – April 1973) in a synthesis of Romanesque and Byzantine styles, the barrel-vaulted sanctuary seats 1,300 people. Born in New York City, Edward Shire was educated at City College (1889-93), Columbia University (Ph.B., 1896), and the Ecole des Beaux-Arts, Paris (1898-1900). Formerly in the firm of Shire & Kaufman, he started his own firm, Edward I. Shire, in 1900. He was also associated with Bloch and Hesse. His work included residential, commercial, industrial, religious, educational, recreational, and health facilities, as well as public and mortuary structures, and interior design. The stock market crash, coming just one year after the West End Avenue premises had been completed, hit Ansche Chesed hard. The congregation revived after the Depression, but by the 1960s and ’70s, many middle- and upper-class Jews had left the Upper West Side, causing Ansche Chesed’s membership to dwindle. The ensuing financial distress became so dire that the United Synagogue of America, the federation of North American Conservative synagogues, assumed control of the building in 1975. Happily, the late 1970s and the Chavurah movement, in which small groups of like-minded Jews created autonomous, egalitarian and lay-led minyanim, brought new life and vigor to Jewish communal life and to Ansche Chesed. Young Jews began joining grassroots minyanim like the West Side Minyan, now part of Ansche Chesed. Another group, Minyan M’at, was formed in the early 1980s and became an integral part of the synagogue. In 1997, Minyan Rimonim was created, becoming Ansche Chesed’s third minyan and fourth prayer group besides the historical congregation, i.e., what is now the Sanctuary Service. Today, Shabbat at Ansche Chesed offers members and visitors alike many paths to spiritual engagement. Rabbi Jeremy Kalmanofsky, Hazzan Natasha Hirschhorn and Ansche Chesed members jointly lead the Sanctuary Service, Minyan M’at holds a lay-led service on the fifth floor, and, on alternate Shabbats, the West Side Minyan and Minyan Rimonim hold lay-led services on the sixth floor. The members of Ansche Chesed gather for joint Shabbat morning services several times a year. They also learn together during Ansche Chesed’s many classes, talks and scholar-in-residence programs; celebrate together at Shabbat and holiday events; and work together to improve our world through social action programs.